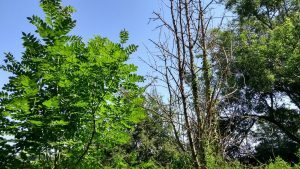 Tighter controls on timber and plant movements into Europe are necessary to prevent further disastrous effects of plant diseases, a new study of the ash dieback pathogen advises. The call to action follows detailed investigations carried out in British woodlands into the population makeup of the Hymenoscyphus fraxineus fungus that causes ash dieback. While the findings bring some hope for the future of ash tree populations in Great Britain and continental Europe, the authors warn that further introductions of variants of the fungus from its native East Asia must be prevented. The research team from the John Innes Centre and Forest Research carried out genetic tests on fungal samples found on ash leaves and stems collected from infected woodlands in England and Wales. Three of the woodland study sites in Norfolk, Suffolk and Kent in the east of England contained ash populations believed to have been infected by windborne fungal spores that travelled from diseased woodlands in continental Europe. Two further English sites, in Devon, Derbyshire and one in Carmarthenshire, Wales, were selected because they were presumed be infected from ash trees planted in the last 10-20 years from nursery stock from continental Europe. The aim of the research was to determine if the mode of arrival of the fungus had an impact on the genetic diversity of fungal populations and how they were adapting to local population of ash. A range of lab and field techniques revealed that numerous infections had established many strains of the pathogenic fungus at each location. There was considerable genetic diversity within pathogen populations in all the sites, regardless of mode of arrival. 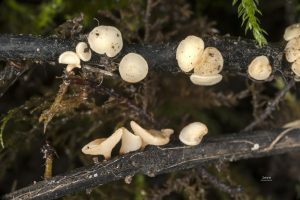 The genetic diversity found in European populations of the fungus had been transferred to all the British woodlands, whether they had been introduced as windborne spores or on imported nursery stock. This genetic diversity is, surprisingly, a positive sign for the future of ash because it allows natural selection to operate within populations of the fungus. The pathogen is expected to gradually evolve over successive life cycles to adapt to the tree rather than killing it. “What we expect in the long run is that the ash and the fungi will reach equilibrium – a kind of armed stand-off, and the fungus will merge into the background as a parasite of only moderate importance,” said Professor Brown. But the study warns that this prospect is based upon the present make-up of the population in Britain and continental Europe. The danger is that new arrivals from East Asia of more genetically diverse strains of the pathogen could be disastrous for European ash. “It’s strongly suspected that ash dieback disease was imported by timber movements from East Asia. Transport of plant material between countries carries a real risk of spreading disease,” said Professor Brown. Dr Elizabeth Orton, a post-doctoral scientist at the John Innes Centre and lead author on the paper, recommends the creation of nurseries containing trees with diverse resistance to the ash dieback pathogen. Nurseries like these would allow the trees to breed together to produce seed that can be distributed to bolster resistance throughout the UK. Read the paper in Plant Pathology: Population structure of the ash dieback pathogen, Hymenoscyphus fraxineus, in relation to its mode of arrival in the UK (Open Access).